Ireland was gently but intelligently ruled by the Tuatha de Danann. They were more of the spirit than the flesh, small of body but large of brain. Then came the big brawny and occasionally brutal Milesians. They were so bloodthirsty that the Tuatha used their brains and disappeared underground before the first week of the Milesian invasion was over. And all this was centuries before the even bigger, brawnier and even more bloodthirsty Celts arrived on the scene and established our own genetic pool and all that comes with it. Anyway, the Tuatha de Danann over time became almost totally converted into the spiritual form which has given us our fairies and mythical presences, including I think the banshees, and the only members of the race that occasionally did -- and do --venture forth in physical form are the leprechauns. They were always in it, the leprechauns, and they are still in it to the present day despite the most malevolent efforts of Fianna Fail in particular and native governments in general at a criminal genocide of our clans of leprechauns. Shameful and scandalous. I mention the important matter this week because it is the beginning of our tourism season, with visitors beginning to arrive from all over the world. All of them want to know more about leprechauns than we locals, because of Fianna Fail, readily are able to deliver. 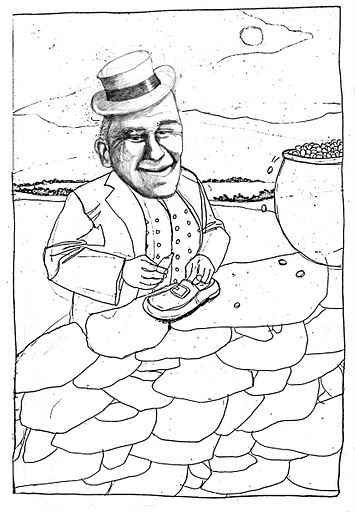 The political facts are that Fianna Fail in the late fifties and the early sixties, believing that leprechauns represented a huge negative element in "the stage Irishman" international perception of Ireland, launched a massive campaign against leprechauns and virtually wiped out all the folklore and information relating to them. They were never mentioned in the nation's schools. Children grew up not knowing anything about their pots of gold. You could search every tourist store in the land and fail to find the genuine image of a leprechaun. They were still there in our midst, but the only time we saw them was on TV on St. Patrick's Day when two false ones with green jackets and false red beards visited the president in the White House. Generations of us were brainwashed into turning our backs on our leprechauns. This is serious stuff. We were exterminating the most perfect and lovable icon of our culture, mischievous and non-aggressive, at a time when other more aware tourist nations were spending billions trying to brand their product with images of furry animals and cartoon characters of all kinds. None of these had anything like the fame and history of our leprechauns. They were so famed in their heyday that the Japanese and Chinese, both canny commercial races, turned out millions of them for the world market. Nowadays, with our battered economy screaming out for tourism revenue, we need our leprechauns far, far more than they need us. They are our pot of gold. The other pots are long since empty. If you are coming to Ireland for the first time this summer, please do not be annoyed by a dearth of information about leprechauns from Irish folk you query on the matter. It is Fianna Fail's fault. I'm no great expert myself but, to give a little help in advance, here and now, I will do what I can to at least get rid of some of the fallacies surrounding our leprechauns. They are clean-shaven little old men in their mortal form. They prefer to wear red jackets rather then the green ones more commonly used in the American world. They wear cocked hats, often without brims, and buckled shoes. They are cobblers by trade and extremely wealthy because of their pots of gold. If you encounter one of them during your Irish holiday the only surefire way to check if he is the real McCoy is to count the number and placement of the bright buttons on his (red) jacket. There has to be seven rows of buttons on the jacket with seven buttons in each row. There will be certainly a twinkle in his left eye. Until the attempted genocide there were many oral stories about the race in our folklore, but many of these have been sadly lost now. Several generations of schoolchildren do not even know that if you can catch and hold a leprechaun he has to grant you three wishes to obtain his release. Many are not even aware of his pot of gold. Sad but true. Nothing could be further from the truth. They are nobly born. I will return with more leprechaun information in the future if readers request it. In the meantime I leave you with one last nugget of information which proves just how wise our leprechauns are. Most of them still dwell in the remote and beautiful coastal areas along the west coast, areas which tourists most commonly visit. Here the temperature is frequently rainy and windy. Accordingly the little man you are likely to spot cobbling away atop a stone wall (never a toadstool!) is almost certainly wearing a sensible thick warm frieze overcoat over his (red) jacket. This overcoat serves two purposes. It keeps him warm and dry as he works. It also makes it difficult for you to check if he has 49 buttons on his jacket and is the genuine article! They are cute wee boyos. That is why I've never met anybody that secured a pot of gold from them.